Are you ready for the easiest project ever? I’ve got a really simple way for you to add a pretty touch of fall to your table. Whether you use these glasses for your Thanksgiving meal or every day, I think you’re going to like the festive touch they bring! – electronic cutting machine and software…or scissors! Step 1: Use your cutting machine to cut a variety of leaf shapes from your gold and brown vinyl. I downloaded a file with six different leaves, sized it to fit my glasses, and cut it out of each of the two colors. Step 2: Adhere the leaves to your clean glasses in any pattern you like. 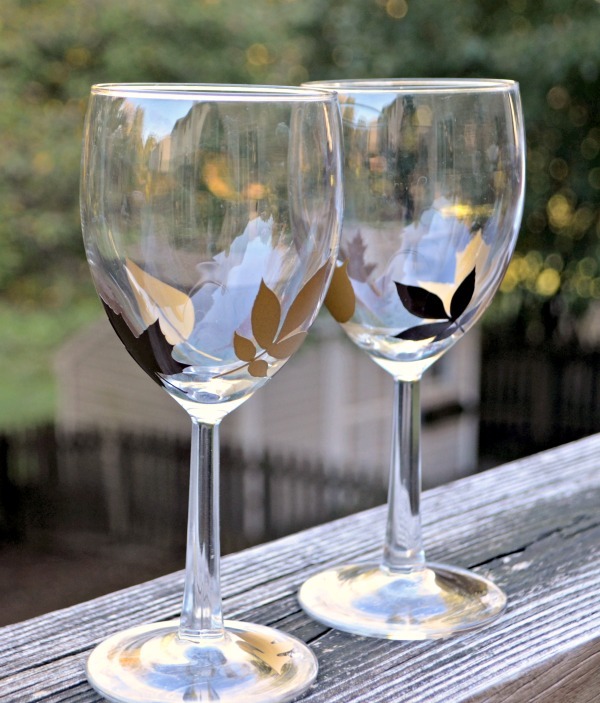 I alternated four brown and gold leaves around the glass and placed one on the base as well. That’s literally all there is to it! The vinyl is removable if you ever want to have your glasses back to “normal” again, but won’t come off with use. You can drink from these totally safely and even put them in the dishwasher. I can’t wait to use these on our holiday table! What about you? Want more fall project inspiration? I’ve teamed up with a group of 75 bloggers today to share tons of Fall Harvest Ideas with you! From crafts, to recipes, to home decor and more…we have you covered for Fall inspiration! These are so pretty! OH I love the new addition of the video!!! Great job, Amy!! oh WOW with the RED….beautiful! Beautiful!! I’m going to do this for Thanksgiving especially. They will look great on the table. Love it!! I love this project! I need a cutting machine to make a set for myself. (Christmas – I hope!) I’m pinning and sharing your project on my FB page!